Monday was my first day trying out the whole vegan thing, and I’ve got to tell you, I wouldn’t have known it with this next dish I’m going to share with you. This sauce is really so F*#$ING cheesy it’s unbelievable. I am definitely a fan of nutritional yeast! Go git you some!! I found this gem from Charissa over at Colourful Palate via Tastespotting.com. Give her some props if you like it! I’ll post the recipe here too, but take absolutely no credit for it. Nutritional Yeast, you have a fan in me! Nutritional yeast lends a cheesy aspect to this dish that is a fantastic alternative to the real thing! Cook spaghetti as it’s package indicates. While the pasta is cooking, add the cold almond milk and cornstarch in a saucepan. Heat up on the stove until thickened. Mix in the rest of the sauce ingredients, and set aside. Heat up a skillet, and add in olive oil and kale. Cook until kale is just wilted. 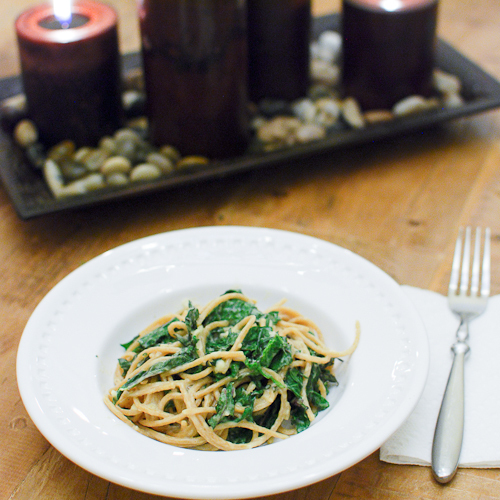 Mix the sauce and kale in with the spaghetti, and enjoy! Is it really good? I am morally opposed to vegan cheese (cuz I’m crazy like that) but I’ll take your word for it… Where do you buy nutritional yeast? Girrrl! I am a cheese LOVER. My favorite place at the store is the cheese case. All the vegan cheeses I’ve had all taste like soy to me, or just too over processed. This really had me fooled, and I’m not an easy one to fool. I mean, you can’t taste that ‘fontina’ or ‘gruyere’ that you’d put in your normal fantastic cheese sauce, but it’s still good. The nutritional benefits are great too. Low in fat, high in protein, and a ton of other stuff that’s listed on the site I linked to. You can get nutritional yeast at a health food store – I got mine at Sprouts, but I’m sure you could get it at Whole Foods or Clarks. It comes either in a plastic jug/jar like protein powder would, or bulk. Looks like yellow fish food flakes. (sorry that’s the first thing that popped into my head.) 😀 I’ll be hunting for other recipes, because I’ve got a ton of the stuff now. this is great!! i love how you include the nutritional information. I’ve had nutritional yeast in my cabinets for FOREVER! Somehow it just never occurs to me to use it. Love this though!